All transactions are safe and secure with a reliable history in online purchasing behind each of our associates. 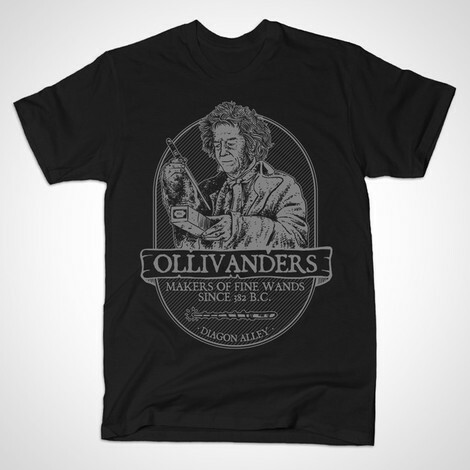 Buy the Ollivanders t-shirt to own Harry Potter clothing and merchandise. Wear this Ollivanders design to cast spells with your Harry Potter wand, but don't engage in the Dark Arts. The Dark Arts refers to using your magic wand to inflict harm. Weasleys' Wizard Wheezes, the joke shop owned by Ron's twin brothers Fred and George Weasley, located at 93 Diagon Alley, sells various Defense Against the Dark Arts products, perfect to defend yourself with when looking for the Deathly Hallows. Pair this Ollivanders design with Weasleys' Wizard Wheezes tees to promote both the wand and joke shop. In addition to the Ollivanders tee above, browse the Harry Potter Clothing Gallery for more apparel like men's and women's clothes, kids shirts or hoodies.